Deadline extended to April 15! ArtBuilt, in partnership with NYC Parks, Queens Museum, Staten Island Arts, Staten Island Urban Center, Canvas/Island Voice, YOUTHBuild Staten Island/JMT Media, Gowanus Canal Conservancy, Friends of Thomas Greene Park, Textile Arts Center, Arts Gowanus, Arts & Democracy, and NOCD-NY is now accepting proposals for: Studio in the Park for summer and fall 2019. 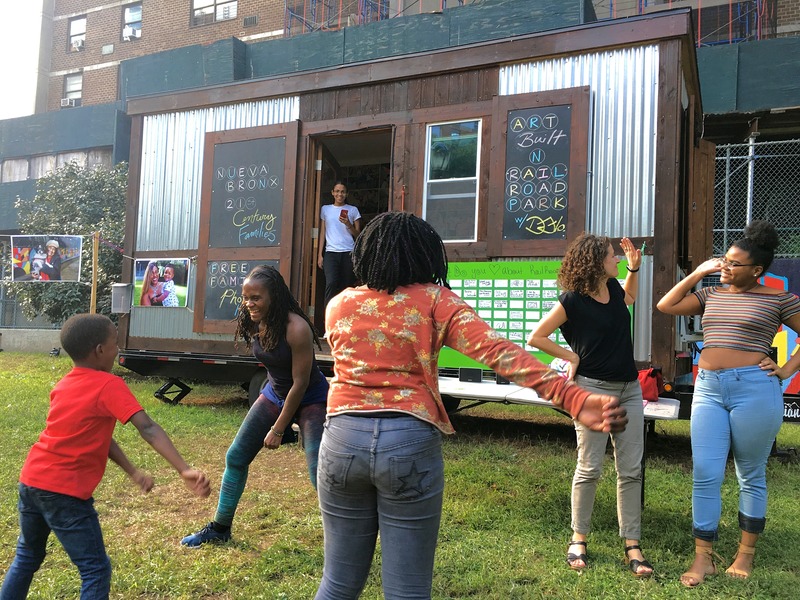 Studio in the Park is a residency program operated since 2015 by Queens Museum, ArtBuilt and NYC Parks, providing an artist or artist collective use of a 150 square foot mobile studio space, situated in an NYC public park, to carry out a community-engaged art project over the course of 6 weeks. In 2019, project sites will be: Thomas Greene Playground in Gowanus, Brooklyn; and Stapleton Waterfront Park in Stapleton, Staten Island. The information session has been archived on Artbuilt’s Facebook page. Stapleton Waterfront Park, connects the Stapleton neighborhood and surrounding neighborhoods in Staten Island with access to the waterfront. Opened in 2016, the Stapleton Waterfront Park was created as part of the multi-phase development of the Homeport, a 35-acre decommissioned U.S. Naval Base on the north shore of Staten Island. Built simultaneously with the neighboring housing and commercial development, the public park includes grass and landscaped areas, benches, water fountains, a fish cleaning station, lit walkways, and a newly constructed tidal wetlands cove. Future phases of development will further encourage pedestrian and bicycle traffic in the Stapleton neighborhood, strengthen the area’s climate change resiliency, and facilitate connections to the formerly underutilized waterfront. Thomas Greene Playground, is located in the Gowanus neighborhood of Brooklyn, and is bounded by Third Avenue, and Nevins, DeGraw, and Douglass Streets. The playground is named after Thomas Greene (1911-1988), resident of Gowanus Houses who served as the president of the Tenant Association, and who was a dedicated community leader. This small neighborhood park is full of all sorts of sunny day activities for local families and people of all ages. Plentiful picnic tables make space for those eating or relaxing outdoors, while those who’d prefer to run around use the two basketball and four handball courts for more active recreation. In the summer, the adjoining outdoor Douglass-Degraw pool opens up for all the area’s swimmers to enjoy. A total stipend of $3000 inclusive of art materials. A minimum of 15 hours studio work per week, including at least one weekend day per week. Public access to studio during predetermined times. Collaborating on a minimum of 2-4 public programs during the residency with community partners, including the Opening Event and Culminating Event. A meeting with ArtBuilt staff 5 weeks prior to the beginning of their residency for basic onboarding and confirming the project plan and schedule, and brief weekly check-ins. If the project changes from the original proposal, then the artist(s) will re-submit a revised proposal (with 2 weeks for time to review). A meeting to be schedule within 2 weeks after the end of the residency for evaluation and debrief process. Selection: In consultation with local stakeholders, a panel of arts professionals will review applications and select residency participants. The panel/jury will include Queens Museum staff, ArtBuilt staff, and NYC Parks public art staff. Selections will be announced in early May 2019. Statement of Intent (250 words max): Describe how you are a social-practice artist and/or any experience you’ve had working directly with communities and/or the public. Project Proposal (750 words max): Please describe the project, which must include your ideas for public events. Strong applications will include a proposed 6-week schedule. Image: ArtBuilt Mobile Studio in the Park program with 2018 David Flores’ Nueva Bronx: 21st Century Families in Railroad Park, Bronx.